"...and then what do you think is going to happen next?" In the 1993 indie Clean, Shaven, Peter Winter (Peter Greene) suffers from severely debilitating schizophrenia, and for reasons that are never clearly stated, one minute he is cowering in the corner of his "cell" trying to silence the noise and hum of the power lines that seem overly amplified in his head, the next he's out on the street. And to help project the vast depth of this mental illness, writer/director Lodge Kerrigan opts to tell much of the story with no dialogue whatsoever, instead using a layered cacophony of sounds and Hahn Rowe's score to force the direction of Peter's actions and reactions to everyday things as he ostensibly searches for his young daughter. Kerrigan utilizes all of the expected peaks and valleys of schizophrenia�hallucinations, delusions, catatonia�as we watch Peter try to simply exist, knowing full well that things that he sees or does may not even be happening. The use of invasive, disruptive sound becomes the driver for Kerrigan to sell Peter's state of mind, and the sensory overload that occurs, so that when a young girl startles him early on, all that is heard on the soundtrack is the off-camera blend of screams and guttural animal noises. In between these often unsettling scenes of Peter's attempts to readjustment to the outside world (such as a particularly cringe-inducing shaving scene) a subplot develops about a child killer, with a police detective (Robert Albert) piecing together clues that begin to point to Peter. Peter Greene (Zed in Pulp Fiction) is wide-eyed and jittery one moment, and then consumed with avolition the next, balancing a wave of obsessive-compulsive behaviors. It is a very effective performance, and if I can loosely quote from The Silence of the Lambs, it really puts the lotion in the basket for Kerrigan, and it is what holds the film together. Greene is full of subtle nuances and ticks, and then broad bursts of self-inflicted abuse, where a search for what he believes are hidden transmitters on his body causes him to remove an entire fingernail in an impromptu bit of dashboard surgery. Kerrigan's reliance the use of sound to explore the portrayal of schizophrenia is fairly unusual and experimental, and it certainly falls in line with Criterion's desire to represent "important" films, in as much as something like this is far removed from your run-of-the-mill narrative. 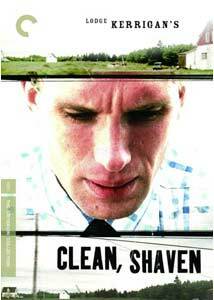 It is highly unique in the way it presents itself�at times an endurance test�and even with some occasional stiff-as-board line reads from a few supporting players, Clean, Shaven is an intentionally discordant, almost eerie experience. Image Transfer Review: Criterion's 1.66:1 anamorphic widescreen transfer may have the Kerrigan blessing, and have undergone a fairly major restoration process, but the resulting print is rather unremarkable. While colors do occasionally take on a natural brightness, overall the hues are on the soft side, and tend to get a little smeary as the film progresses. The bummer here is the heavy grain that is a constant throughout, which is distractingly heavy at times. I trust Criterion has done an exemplary job restoring Kerrigan's film, but this just isn't a transfer that will make you go WOW. Audio Transfer Review: The Dolby Digital 1.0 English mono track has been cleaned up, removing all sorts of clicks and pops. Some of the dialogue gets a little lost at times, but the real star here is the cascade of sound that Kerrigan uses to represent Peter's mental torment. It's an intentionally harsh and jarring mix, all ugly and shrill, and the presentation here is properly simple and edgy. A more expansive mix may have ultimately made the schizophrenia more encompassing and disturbing, but the simple approach works well. Extras Review: Extras include a commentary/interview track with writer/director Lodge Kerrigan, conducted by Steven Soderbergh (The Limey, Traffic). There are a few scene-specific moments, but much of it has Soderbergh quizzing Kerrigan on his early days, the budget and the element of "circumstance and conjecture" that permeates Clean, Shaven. A bit on the low key side, but the content is actually rather revelatory, including Kerrigan mentioning he originally intended this to be a project for television. A Subjective Assault: Lodge Kerrigan's Clean, Shaven (09m:20s) is a brief look at the film, from the viewpoint of critic Michael Atkinson, who gets wordy on the whole "narratively uncooperative" and "layered anxiety" veneer. Atkinson's discourse is a little flowery, but he makes the obvious links to Hitchcock, Bergman, Polanski, and of course Cronenberg. There are also 17 separate MP3 files of compositions from Hahn Rowe's soundtrack, so if you want that edgy, jarring weirdness on your iPod you're good to go. An insert foldout booklet features a three-page article by Village Voice writer Dennis Lim expounding on Clean, Shaven, who at one point refers to it as a "remarkable alchemy of clinical details and raw poetry." The disc is cut into 21 chapters, and features optional subtitles captioned in English for the hard of hearing. This is an odd one alright, an edgy 1993 film that wants to put you in the head of a schizophrenic. There's a subplot about the hunt for a child killer, but it is the combination of Peter Greene's tightly manic performance and the harsh sound mix that makes this such a hypnotically bumpy ride. Not for everyone, but if you like them "different" then this one fills the bill. Highly recommended for adventurous viewers.